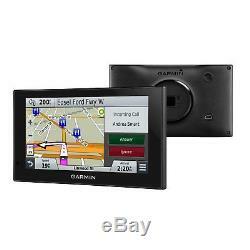 Garmin Camper 660LMT-D Motorhome Caravan GPS SATNAV FREE LIFETIME Maps & Traffic. A Dedicated Camping and Caravanning Sat Nav. Custom routing(1) for the size and weight of your camper or caravan. Road warnings for bridge heights, weight limits, sharp curves, steep gradients and more. Camper and caravan specific directories; filter campground search results based on your preferred amenities. Easy Route Shaping lets you easily change your route to include preferred roads or cities, just by touching the screen. Elevation map tool displays possible steep gradients along your route. Camper 660LMT-D, our latest navigator for the camper lifestyle, lets you enjoy the freedom of the open road with the convenience of traveling with a helpful guide. Camper 660LMT-D guides with an easy to read 6.0-inch pinch-to-zoon display that fits comfortably in your car or camper, routes based on camper and caravan dimensions(1) and road warnings, and includes a directory to campsites. New to the Camper product line, our 660LMT-D model offers Easy Route Shaping, Elevation Profile information, and millions more new and popular places thanks to Foursquare®. New Profile for Caravan Routing. Camper 660 LMT-D is designed to simplify navigation with motorhomes, caravans and campers. It comes preloaded with detailed maps of Europe, including information on road restrictions, such as bridge heights, and related data for most major roads and motorways. Just input the specs of your camper or caravan, then Camper 660LMT-D will use your camper profile¹ to find the most efficient route across Europe. Your route will be determined based on the height, weight, length and width of your vehicle. Route Warnings & Elevation Profile. Camper 660 LMT-D is preloaded with detailed maps of Europe that also include camper-related restrictions, such as bridge heights, sharp curves and related information for most major roads and highways. Youll hear and see these helpful warnings which can help prepare you for potentially hazardous situations. Camper 660LMT-D features a handy map tool that allows you to view upcoming elevation information pertaining to your route all while viewing your map navigation screen. You can even tap on the elevation information to expand the elevation profile view and see your current and upcoming elevation in greater detail. Viewing this information helps prepare you for possible steep gradients along your route. Directory of more than 9,000 Campsites. Camper 660LMT-D features ACSIs Campsite Directory. This comprehensive listing of campgrounds contains more than 9,000 sites in Europe, with information about price range, hours of service, and more. ACSIs Campsite Directory lets you search by preferred amenities such as pet-friendly, on-site shops, electric hookups so you can easily find what you want, away from home. Easy Route Shaping & Scenic Routing. When you prefer to drive on certain streets or through specific towns, Easy Route Shaping lets you easily modify your route. Just add a point to the route you see onscreen and youll see a notification regarding how much time will be added. With Camper 660 LMT-D your journey is the reward. With its optional scenic route setting you can choose to discover more off the beaten tracks. Easily preview your scenic route in the route preview menu and enjoy the freedom of the open road. Camper 660LMT-D offers the convenience of voice-activated navigation. Speak and your device responds to your commands. Your hands can remain on the wheel. Of course, you can also navigate using the touchscreen interface. Sync a compatible Bluetooth®-enabled device, such as your smartphone, to Camper 660LMT-D for hands-free calling through its integrated microphone and speaker. Camper & Caravan Speed limits. Camper 660 LMT-D ensures you always stay aware of the speed limit for your motorhome or caravan, which often differs from standard cars. Specific speed limits and estimated arrival times are clearly displayed so you can enjoy a more relaxed journey. 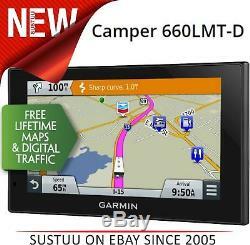 Camper 660LMT-D keeps your driving map onscreen at all times and additional information appears alongside. With a quick glance, you can see the name of your current street. It also shows school zone warnings. No matter where you are, always know whats close. Up Ahead shows a constant stream of nearby places including fuel stations, rest areas and campsites that appear alongside your driving map and updates as you move along your route. 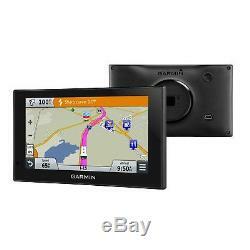 Garmin Navigation Made Even Easier. Camper 660LMT-Ds database of preloaded points of interest now includes millions of more new and popular places thanks to Foursquare. Easily find restaurants, shops, sights and more along your route. Camper 660LMT-D redefines spoken turn-by-turn directions with Garmin Real Directions , easy-to-understand driving directions that guide like a friend, using recognizable landmarks, buildings and traffic lights. For example, when navigating youll hear easy directions such as, Turn right after the pharmacy. No more stress from trying to read street names. Garmin Real Voice is refined speech technology that sounds more like a natural, friendly voice. 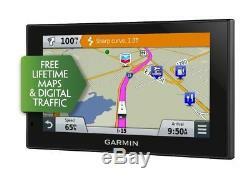 Garmin Real Directions and Garmin Real Voice are features that are only available in Garmin GPS navigators. Navigate Complex Interchanges with Ease. Camper 660LMT-D has Active Lane Guidance (ALG). ALG uses voice prompts and brightly coloured arrows to indicate the proper lane needed for your route. PhotoReal junction view shows exits as they appear in real-life: in full colour and great detail. Birds Eye junction view offers a detailed view of interchanges, looking down from overhead. Ease the stress of reversing with a. BC 30 wireless backup camera. It lets you easily see behind your Camper at any time but is invaluable when reversing. Compatible with Smartphone Link App. (5) is a free mobile app that connects your Camper 660LMT-D with your iPhone or Android smartphone. When paired, your Camper 660LMT-D can use your phones existing data plan to share information. Smartphone Link also gives you access to Garmin Live Services, useful real-time information such as weather or live traffic information available free and by-subscription. When you use Smartphone Link app with Camper 660LMT-D, you can also check-in on Foursquare and access more detailed information about the POI, including ratings, price range and hours of service. Download Smartphone Link for Android in the Google Play store. Download Smartphone Link for iPhone® at iTunes. Includes Lifetime Map and Traffic Updates. Camper 660LMT-D features free map updates for the useful life of your device, so routes can reflect the most up-to-date maps, POI's and campsite directory information. With the included combination power cable/traffic receiver, your Camper 660LMT-D offers free digital traffic information(3) for the useful life of your device. Camper 660LMT-D can help you avoid traffic jams and find any possible time-saving detours you need to keep moving. To keep your Camper 660LMT-D up-to-date. Garmin Express makes it easy to update maps and software, transfer favorites to and from devices and install free custom vehicles and voices. (1)Not available in all areas. Entering your Camper or trailer profile characteristics does not guarantee your Campers characteristics will be accounted for in all route suggestions. Always defer to all posted road signs and road conditions. Contact your mobile service provider for more information about your service plans data and roaming rates. The Bluetooth word mark and logos are owned by the Bluetooth SIG, Inc. Foursquare and the Foursquare logos are registered trademarks of Foursquare Labs, Inc. THE LATEST IN TECHNOLOGY DELIVERED WORLDWIDE. ITEM DISPATCHED FROM OUR UK WAREHOUSE. Turn right ON ELM STREET in 500 ft. Yes(with Garmin Real Directions). Voice-activatednavigation (operate device with spoken commands). Trafficcompatible (routes around traffic with a receiver and subscription). Lifetimetraffic updates (receive free lifetime traffic updates). Laneassist (guides to proper lane for navigation). Routeavoidance avoid highways, tolls etc. Speedlimit indicator displays speed limit for most major roads in the U. Viewupcoming points of interest along route. 16.8x 9.4 x 1.9 cm. 13.6x 7.2 cm; diag 15.4 cm. 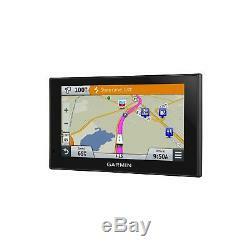 Multi-touch, capacitive, manual dual-orientation, WVGA color TFT with white backlight. CustomPOIs (ability to add additional points of interest). Displayscurrent and upcoming elevation of roads while driving. Includesa directory of ACSI inspected campsites. 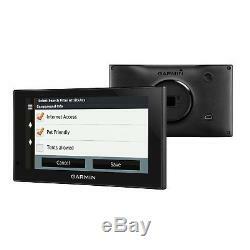 Externalvideo input for compatible backup cameras. Receivelive services via your compatible iPhone® or AndroidTsmartphone with Smartphone Link. SpecialisedCamper routing supports Camper-related restrictions in Europe(customisable by height, weight, length, width). Lifetime maps and traffic (indicated by LMT-D after model number on the box). Lifetime Digital (DAB) traffic receiver/vehicle power cable. Comes in Garmin Retail Packaging so makes a Great Gift. This product has no reviews yet, however see what our buyers say about our other products..
Or give us a ring anytime from 09:00 to 17:30 GMT, Monday - Friday, on 0203 0111 888. The item "Garmin Camper 660LMT-D Motorhome Caravan GPS SATNAV FREE LIFETIME Maps & Traffic" is in sale since Friday, November 17, 2017.